Some of our blogger friends have been sharing their Valentine ideas with us this week. 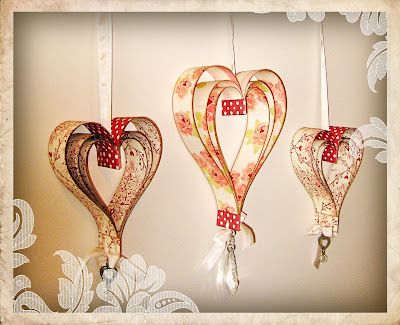 When Shawna K. saw the post we did on this, she changed it up a bit to make these for Valentines day. Darling! Shawna, we hope these hearts are keeping you warm up there in Canada...burrr!! 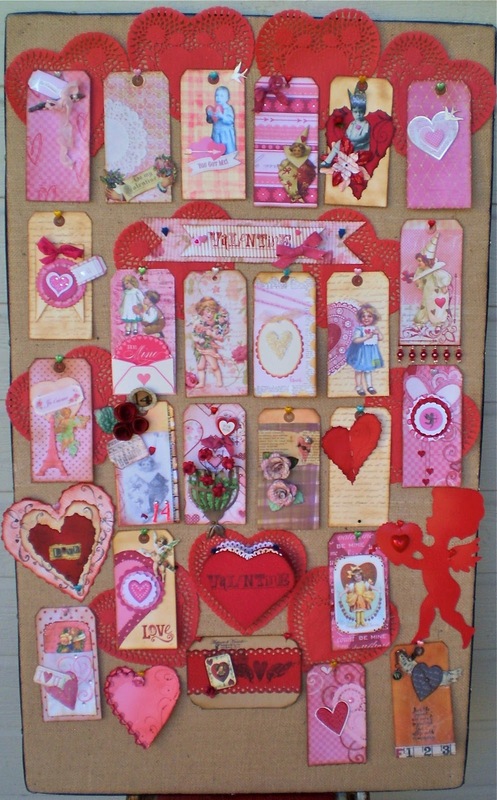 And from our friend Bobbie W...She decided to transform her Advent Calendar burlap board into one she could use for Valentines day...just look at all the tags! Great use of the board after December (mine is just sitting behind a desk). How about some easy cards? They don't have to look just like these that Debbie made, but we thought you might need some inspiration to get you started. My personal favorite is 'Pitter Patter' with the double photo holder. 1. 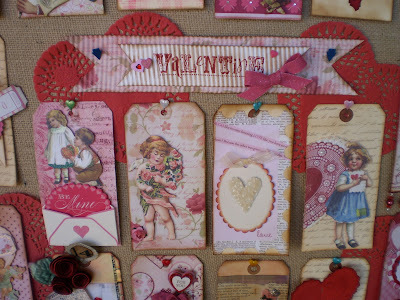 To make this card start by sewing a piece of patterned paper to the front of the pre-folded card. 2. Find a fun old photo or even better use one of your own. Tape photo to card with small strips of gaffer tape. 3. Attach small arrow pointing to "smitten" person and cut tiny heart from red gaffer tape and place above other person in photo. 4. Type and print tiny word (I used smitten) and place inside Mini Label Sticker and apply to card. 5. To line envelope, use the top half of the envelope with flap open as your pattern. Trace around edge, cut out just inside your tracing line so it fits inside envelope and adhere. 6. Print another word to be attached to the inside of your card and stitch a frame around it. 1. Start by stitching around the front of a pre-folded card. 2. Use a sturdy wire (about 20 gauge) to make wire piece. Cut an 8" piece of wire. Leave about 2 1/4" straight section in the center and wrap ends around a 1/2" dowel a couple of times. Make sure the wire loops on end are "tight" to each other so it will hold the items inserted in place. Trim excess on ends with wire cutters. 3. Attach wire piece to card by making two small holes on each side of the wire and tying it on with ribbon. 4. Copy old photo onto cardstock, cut out and distress edge. 5. Cut mini heart out of red gaffer tape and place on photo. 6. Stamp word onto a jewelry tag and tie to wire. 7. Print sentiment on cardstock. Leave a space for a paper(or gaffer tape) heart to be applied. 8. Place picture and sentiment in between wire loops on each end of wire piece. 9. Line envelope as described in previous card. This is actually a little book with a box inside. I found a small book at a thrift store that was only about a half inch deep. 1. Take out all the pages in the book, just leaving the cover. 2. Cover the outside of the book with paper, layering paper and embellishing with metal pieces and ribbon. 3. Cover the inside of the book cover with a piece of paper slightly smaller than the book cover. 4. Out of book board, create a box that is slightly smaller than the books dimensions. Allow space for the bulk of several layers of paper. Score folds into the chipboard and reinforce corners. Cover box with printed paper and glue to inside back cover. 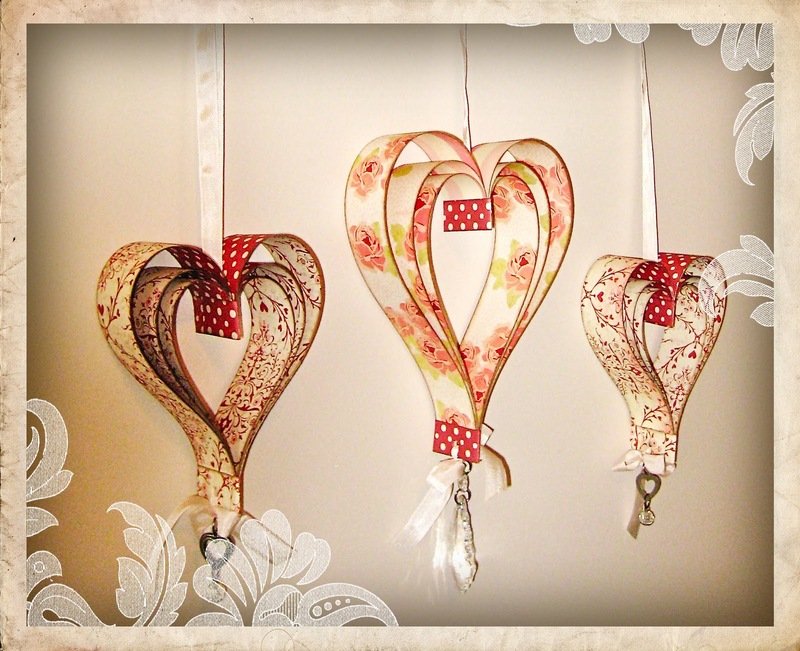 Add your own special "love notes". See you on Friday with more! Fabulous projects! Love this inspiration! I also got some inspiration from your wonderful blog with the huge glass dome. Love these projects, especially "Pitter Patter" and "Amore". Going to make a book with a box inside for my sweetie! Thanks for the inspiration! Ooops - and if you didn't check out the domes on Woodandfabric's blog, you need to because they're incredible! Do you guys ever sleep? Love your ideas!